If you’ve been following this blog for any time at all, you know that we’ve been spending a great deal of time building a hoophouse, or a high tunnel, out at our place. This project has helped to fill our usual desultory and dull extra hours. (I’m just kidding. There’s rarely a desultory hour out here, but it’s a fun word to toss about.) If you’re interested in reviewing the entire process–successes, roadblocks, tasty fortifying snacks, animal interference, et al, here is where you can start, in my first post entitled “Building a Hoophouse isn’t for Sissies. And it’s not, by the way. Building a hoophouse isn’t for sissies. That much is patently obvious. When I coined that phrase, I really had no idea how true it was. But is is. True, that is. At the time (when I wrote that first, thrilling post!) I had no idea how much time it was going to take us to build this seemingly-simple structure. We had the impression that we’d have it up in a couple of long weekends. Ho, ho! How naive we were. But we’re nearly done now. We’ve actually done very little in the past few weeks, since Bryan put up a nifty overhead watering system, except (ahem) the fun stuff: planting and watering. And this week, harvesting. Yes, Gentle Reader, I picked my first veg from our hoophouse! It’s Party Time, baby! I planted a flat of baby pak choy in the early spring, in the house, with all my tomato and pepper and eggplant and leek plants. 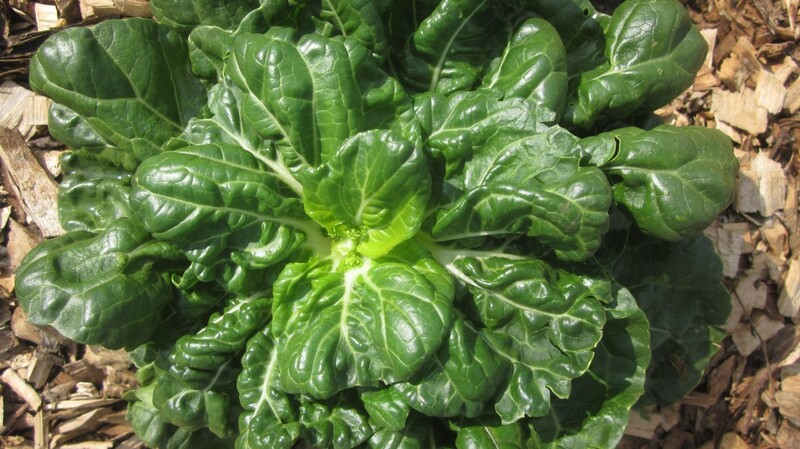 (If you’re curious about the variety, it is “Extra Dwarf Pak Choy” by Baker Creek Heirloom Seeds, though mine–for some reason–didn’t stay “extra dwarf” or even merely “dwarf.” I don’t know why, but I’m not complaining. It’s actually more like a “Freakishly Gigantic Pak Choy.” I think Baker Creek might consider re-naming it.) I don’t even know why I wanted to grow baby pak choy so much, I really don’t. I do really like anything miniature, ask anybody. Babies. Tiny tea sets. Polly Pockets. Chicks. Makes sense, doesn’t it? Maybe part of the reason that I wanted to grow it so badly, was that I tried to grow a bed of it last summer, but the drought hit just as those cute little plants were struggling to get their roots grown. When that fierce hot south wind blew across our plains aimed straight at my unprotected garden, it just gave up. My entire bed of Extra Dwarf Pak Choy (even with prior copious watering!) dried up and perished, just tiny pitiful withered plants, oh boy, it was sad. But this summer has been different, and I’ve carefully tended my flat of baby plants all summer, watering them, sometimes, twice a day, rushing them into the garage when thunderstorms or hail hit, protecting them when the summer winds blew. And finally I was able to plant the tiny (a bit rootbound, it’s true) plants into the hoophouse. With the excellent manure that we worked into the soil, and the care that I’ve taken with those plants, they have just grown beautifully. Though I’ve never grown pak choy before (successfully) they appear rather perfect to me. They are crinkled and crispy-leafed and a deep rich green color, and when I slice them up into stirfry, they are full of moisture and crunch. Do perfectly beautiful vegetables make you smile? They do me. 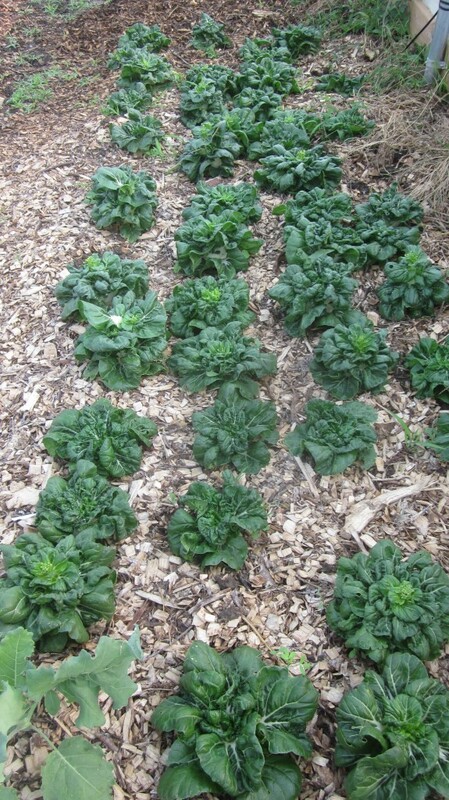 So now that I have an entire bed of pak choy flourishing away, the puzzle is what to do with it all. I’m going to take some to Farmer’s Market this week, in hopes that there will be some adventurous souls in Seward, Nebraska, who will want to cook them up for supper. Here are some ideas for what to do if you happen to have a hankering for pak choy, or happen to run across some beauties like this one at your farmer’s market or grocery this week. Or if you just coincidentally planted an entire bed of them this spring, too. Stir-fry with broccoli, sliced almonds or cashews, and soy sauce. Serve with steamed fish. 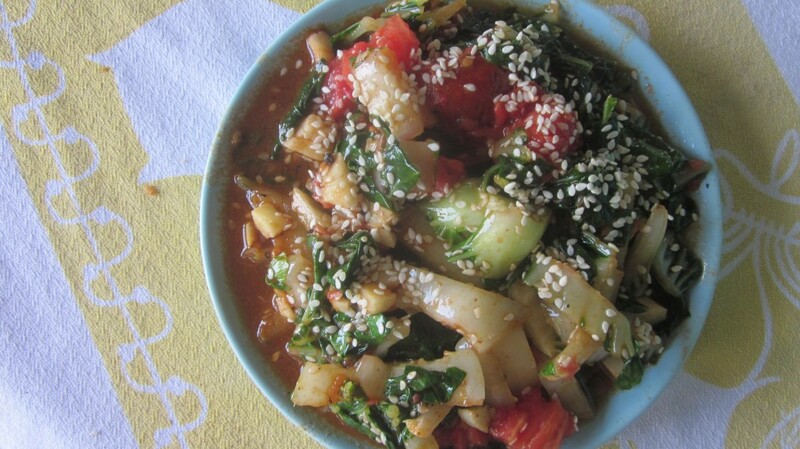 Stir into Miso soup, or any vegetable soup that would benefit from a bit of green crunch. 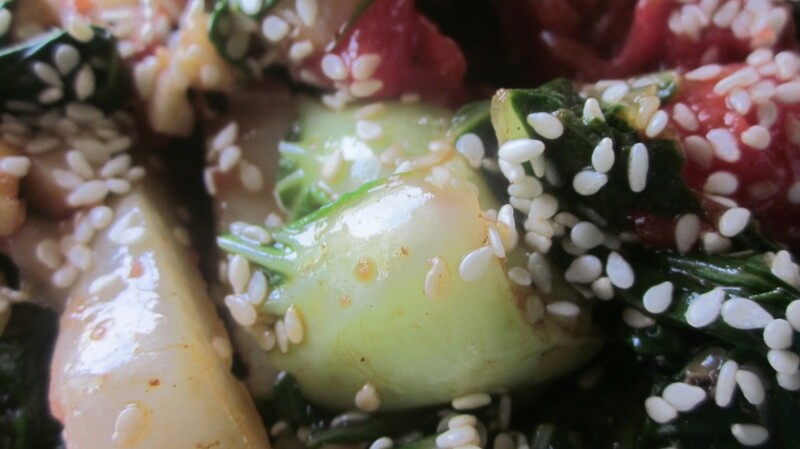 Try my recipe for Balsamic Sesame Pak Choy! This dish is so easy, and so good! You can imagine how delighted I was, with such a large bed of pak choy to go through, to find a recipe that was so quick, so easy, and such a good way to consumer pak choy. I hope my family is ready to eat this every day for the next week. So without any further ado . . . here’s my recipe. This quick and easy stir-fry is great with rice, or as an accompaniment to fish or chicken. First, smash and mince the garlic and put to marinade in the oil. Wash the pak choy well, separate the leaves, and chop. In a heavy skiller (I prefer cast iron) saute the minced garlic for a few minutes, until it starts to get translucent. (Don't go check on your Facebook status, and burn it! I don't know who ever does this sort of thing, but I've heard people sometimes do.) Add the pak choy and stir-fry for a minute or two. Chop the tomato and add to skillet, and cook just until heated through. Stir in sesame seeds and balsamic vinegar, and season to taste with salt and pepper (freshly ground is nice!). It's ready! I love the way the sauce glistens on the veggies! Tagged on: balsamic sesame pak choy, easy pak choy recipe, how to cook pak choy, what does pak choy look like? ← GOT Squash Bugs in your garden? Eradicate these pests . . . naturally! Hmm . . . I’ll consider that, Roy. I do love avocado . . .
It’s very good and you should try it as soon as possible! You’ll love it! I love pak choy and I must admit, I am a little jealous of all those beautiful pak choys. That recipe sounds delicious! Thanks for sharing. Thank you Courtney. I wish you could come by and pick up a few! What a delightfully simple yet interesting lunch!! Cooking doesn’t have to have a lot of ingredients and be fiendishly complicated. Thanks for sharing about the hoop house too. 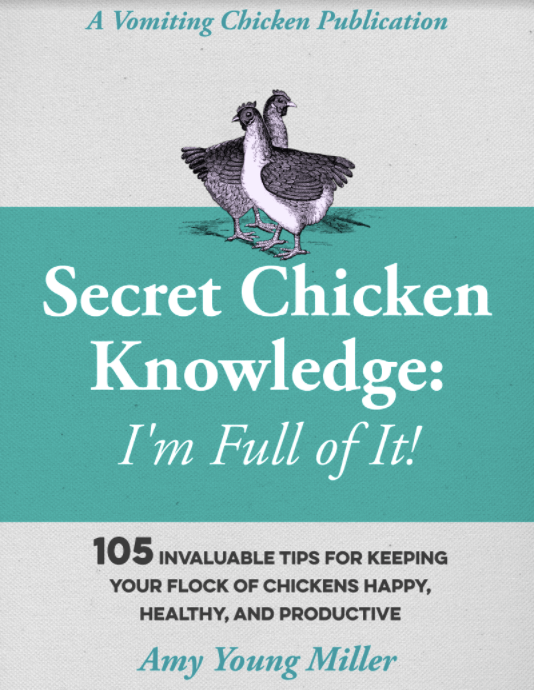 I found that very instructive and entertaining, which is what makes a blog excellent. ps. I like your anti-spammer methods. I love pak choy! Why are you so far away? I pinned your recipe, by the way. I wish you were closer, too, Alana, I have lots to share! Now looky looky looky, The giant pak choi are utterly brilliant and the recipe? Oh boy oh boy. It’s delicious and I am cooking it next week, without Avocado ! Pak Choy is a delicious vegetable, and your plants look perfect. You’ve spent so much time naturing them, they should be. Thanks for the recipe. 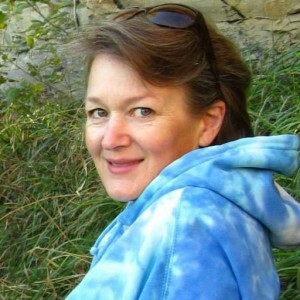 Thanks Francene, and thanks for the tip about your blog post. I enjoyed it entirely!